Sometimes it’s good just to meet up with people who share the zest for travel, the outdoors, and the chance to escape the day-to-day. If your method of escape is TCs (truck campers), then it’s great to have lunch with local members of NATCOA! 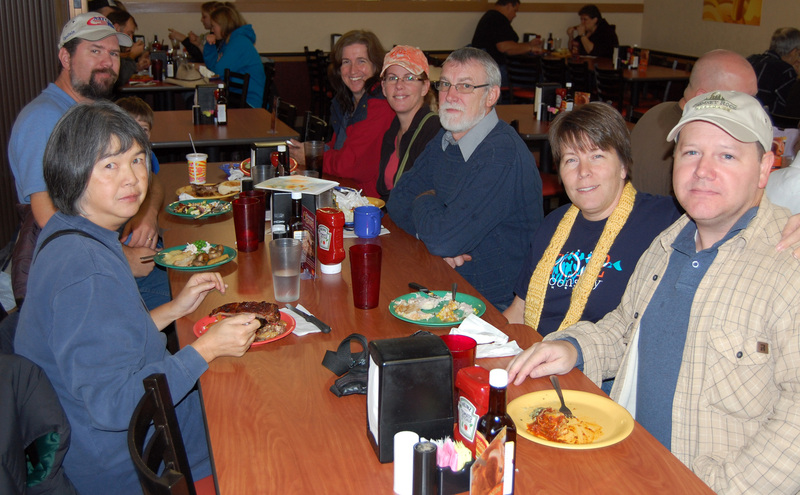 We had the opportunity to do just that … at one of the local buffet shops, Golden Corral. Over steak, ribs, stir fry and cotton candy, we swapped stories, compared options on our rigs, and learned of recent trips. Some have put their RVs away for the winter, but many of us are just getting started. One couple just got back from Hauser Lake – and they reported sunny weather and a quiet weekend. Nice. As we talked of things great and small, Rich (otherwise known as “fearless leader”) directed out attention to LEDs from Doug of LEDTrailerLights.com. 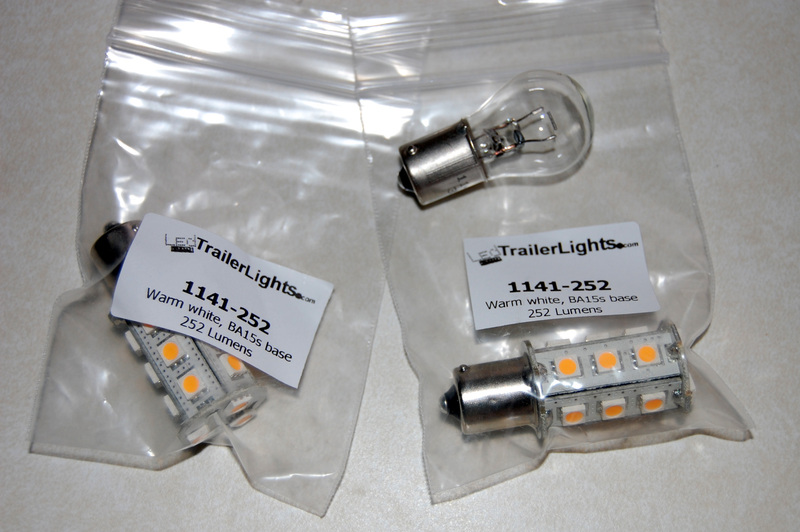 We’ve the opportunity to check ’em out – bright white LEDs that just plug in where your 1141 bulb used to be. Nice. 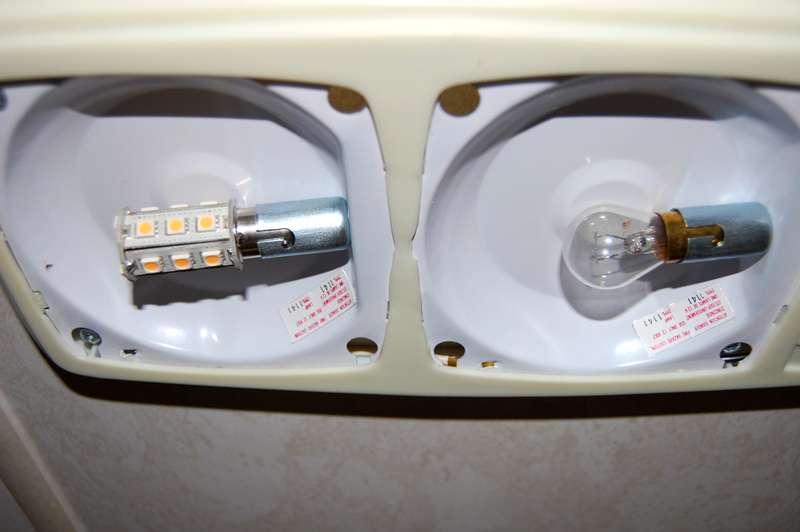 The old bulbs get hot and burn 18-27 watts … the LEDs only 3.6 watts, and of course, remain cool. Light up the night in your RV without draining your battery! Other topics? Well, there’s a winter weekend coming up in January at Schweitzer Resort, then the Spring rally over on the westside (that’s what ya’all can call the Seattle/Tacoma area of the state), and the rally at Glacier in the summer. Yes, it’s good to have a group of folks who share your enthusiasms! We missed the stories of XNORP and Lady C … hopefully next time. And, for readers, XNORP is not a computer related reference … oh this is a great story, maybe he’ll let us put it up sometime. So, where all did ya end up for lunch? It was a Golden Corral day … they had steaks on the grill, BBQ ribs just out of the oven, roasted turkey and other roasts … meat lovers delight! When are you coming through our part of the country?? Heh, I meant where was the Golden Corral? I’m starting west tomorrow evening, after visiting the Henry Ford Museum in Dearborn, MI. GC on division in Spokane. Always packed with folk … perhaps a sign of good eats? Will you be passing through our neck of the woods on your return … or are you heading for warmer climes? I will be close by, but not in Spokane, as I’m coming back the I-80/84 route on the return trip. A beautiful trip that will be … we join up with our cycling friends (who are cycling across the US a piece at a time) next year in Rawlins, on I80. We’re looking forward to your trip report – travel safe!